The registration process is now active and will continue until March 5, 2019. The online application forms have been released and are now available. Candidates are advised to go through the detailed notification on the website before filling the online application form and check their eligibility before they apply. CTET 2019: The online application process for CTET 2019 has commenced from Tuesday, February 4. 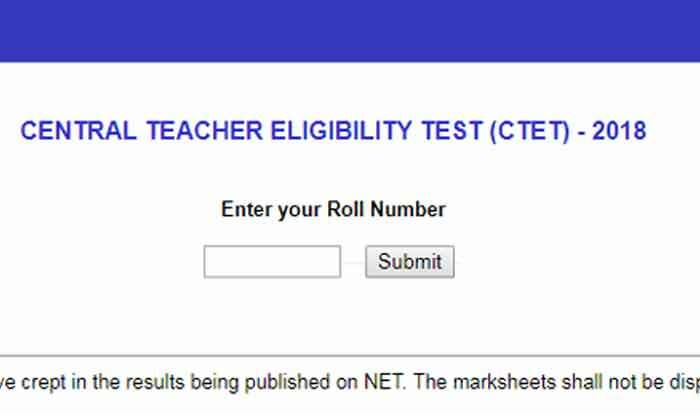 The Central Board of Secondary Education (CBSE) released the notification and detailed information bulletin for Central Teacher Eligibility Test (CTET 2019). Candidates are advised to visit the official website- ctet.nic.in. Step 1: Visit the official website- ctet.nic.in. Step 2: On the home page, click on the link- ‘Application Form for CTET 2019’. Step 3: Click on Apply. Candidates who have already registered may sign in. Once you register, you would be sent an OTP on the provided email id. Complete the registration and fill the details in the online application form. Step 4: Upload the scanned documents and pay the fees. Fees for only Paper I or Paper II is Rs. 700 for General candidates and Rs. 350 for reserved categories. Candidates belonging to the general category will have to pay Rs. 1200 while those belonging to the reserved category will have to pay Rs. 600. Step 5: Take a print out of the confirmation page and keep the same for future use. For CTET 2019 Paper I, candidates should have passed Class 12 with at least 50 per cent marks and passed or appearing in final year of 2-year Diploma in Elementary Education or 4-year Bachelor of Elementary Education (B.El.Ed) or 2-year Diploma in Education (Special Education) or Graduation with at least 50 per cent marks and Bachelor of Education (B.Ed). For CTET 2019 Paper II, candidates must have graduation degree and passed or appearing in final year of 2-year Diploma in Elementary Education or in 1-year Bachelor in Education (B.Ed) or in 1-year Bachelor in Education (B.Ed), in accordance with the NCTE or 1-year B.Ed. (Special Education).